Ø How does it do it’s magic. How does it make things happens so quickly? 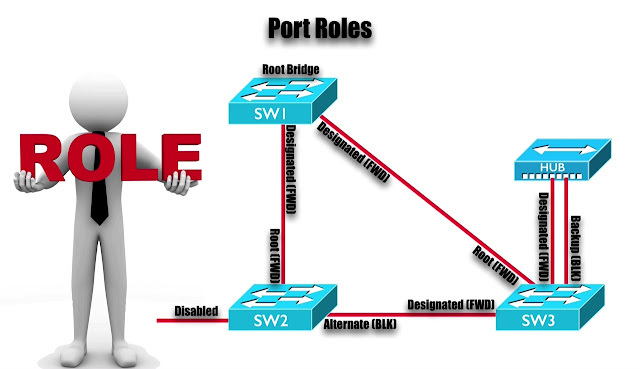 First let’s talk about some different Port Roles, and some of these are similar to different Port states. We had with Traditional 802.1D Spanning Tree Protocol for example, we are still going to elect a Root Bridge and in this topology. 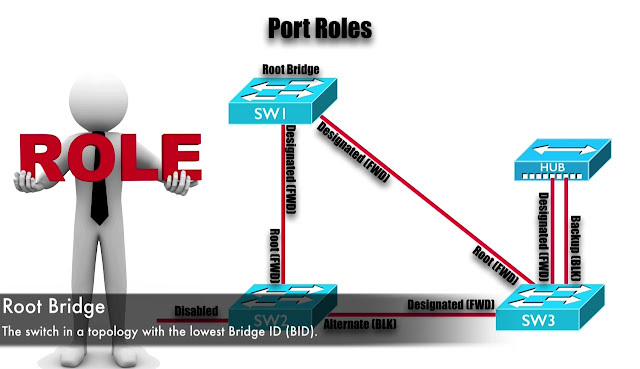 We see that Switch Sw1 has been elected as the Root Bridge, and we know that all the Ports on a Root Bridge are Designated Ports. 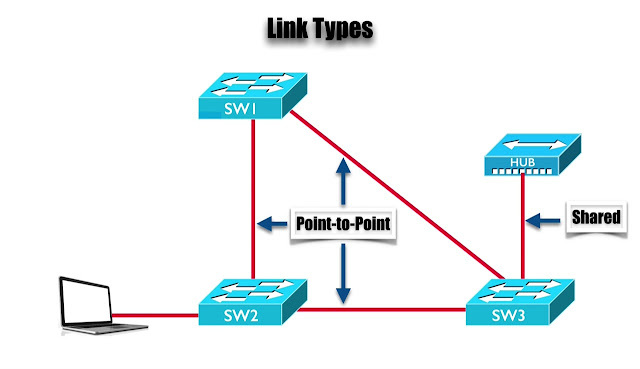 Remember every segment has one and only one Designated Port and “it’s the Port on that segment that’s closet to Root in terms of Cost”. 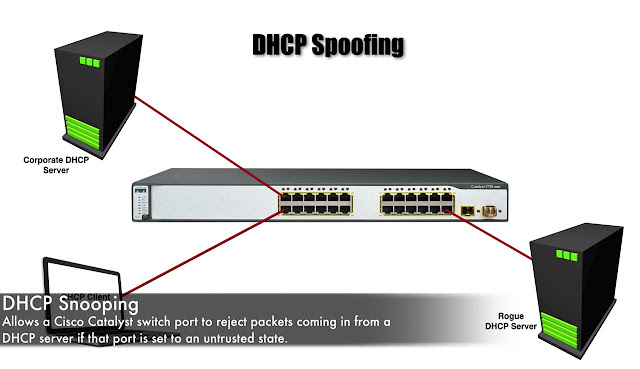 We mentioned earlier that, we don’t get closer to Root, then actually being on the Root no difference here, we have couple of Designated Ports on Switch Sw1, now let’s take a look at Switch Sw2, we still have the concept of the Root Port. Remember “ a Root Port is a Port on Non-Root Bridge that was closest to Root in terms of Cost”, and let’s assume that, Top Port on Switch Sw2 is the Root Port, we still have a Root Port with Rapid-PVST+, and we still might have a Port that is Administratively Shutdown, it’s not gonna be forwarding any data. 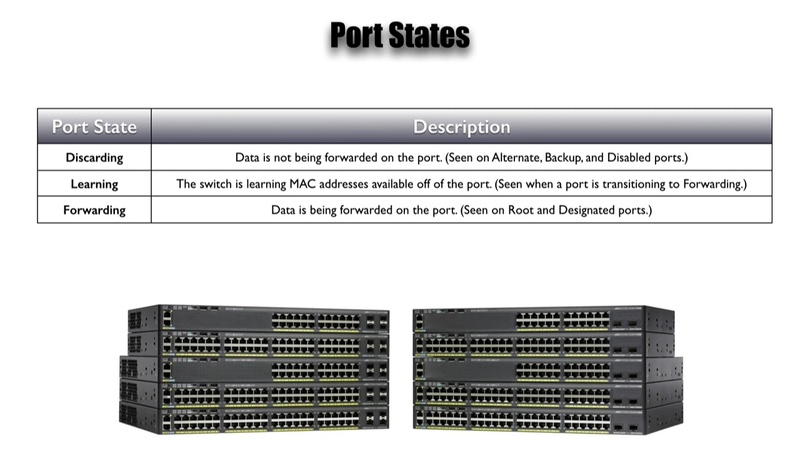 Notice the Designated Ports and the Root Ports they forwarding, our abbreviated that is “fwd.” The Disabled Port, it’s just down, it’s Administratively Shutdown, it’s not forwarding traffic on either, and on that link between Sw2 and Sw3, we need to have a Designated Port “it’s the Port that’s closet to Root in terms of Cost”, and if the Costs are equals we going to go with the end of the segment connected to Switch, with a lowest Bridge ID. And let’s assume that for our discussion, we will say that Switch Sw2 has an Alternate Port and Switch Sw3 has a Designated Port on that segment, and now let’s defined the terms Alternate for movement, we typically just referred to this as a Blocking Port when we talking about regular PVST+, now i am saying that we have an Alternate Port, and “Alternate Port as the name suggests, is an Alternate way of getting to the Root Bridge”. Switch Sw3, it’s gonna have a Root Port and we were saying, it’s that Port going straight up to Sw1, but now where it gets interested, notice Sw3 has a couple of Ports connected to this HUB and since we have Two Port connected to this shared media HUB that means that both of these Ports are probably on the same Vlan and because we connected to a HUB that means that both of these Ports are on the same segment, where on the same shared Ethernet segment, and remember we can only have One Port on a segment that’s a Designated Port and we saying, it’s that First Port on Sw3 that goes up to the HUB but the other port going up to the HUB is labeled as a Backup Port. That’s different then the Alternate Port, both an Alternate Port and a Backup Port are considered to be Ports “that would be Alternate ways of getting us to Root” but we only see a Backup Port then we have a Redundant link to a Shared segment, meaning that about the only time we would see a Backup Ports when we were connected to a Ethernet HUB and as a result, it’s unlikely we don’t gonna see a Backup Port in production networks but we need to know about it because it is the defined in the Standard. 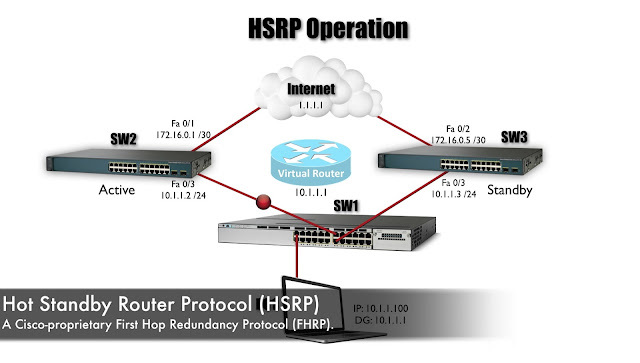 We also need to know about the Port States used by Rapid-PVST+ or Rapid Spanning Tree Protocol. We got a Discarding State and a Port that in the Discarding State is gonna be Discarding data fames, by the way it’s not discarding a BPDU’s frames it’s still receiving those but it’s discarding data frames and we would see a Port Discarding data frames, if that were an Alternate Port, a Backup Port or a Disabled Port. 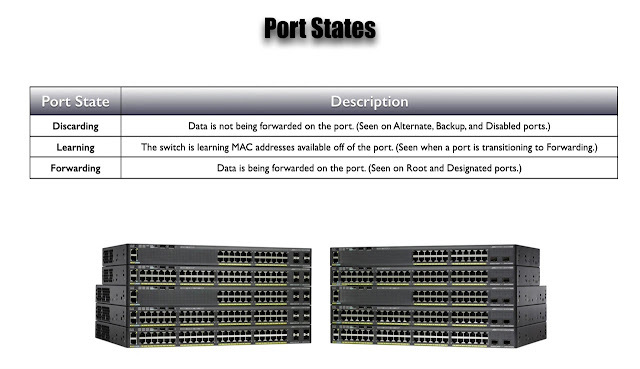 Another Ports State is Learning, Learning is when we Transitioning from the Discarding State to the Forwarding State, notice here, there is not a Listening State like we had with Traditional 802.1D Spanning Tree Protocol, there is no Listening State, there is a Learning Transitional State, and in the Learning State, a Switchport is Transitional to a forwarding State and it’s Learning Mac-Addresses that live of that Port. 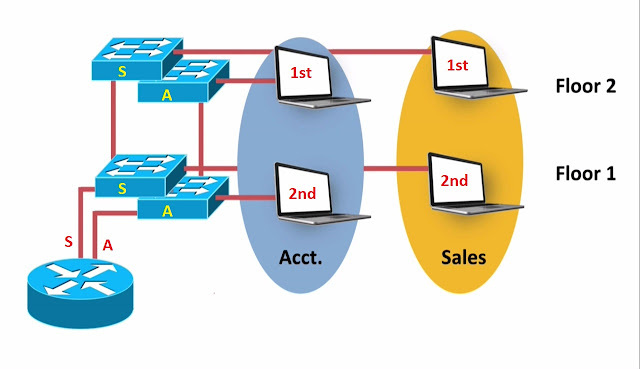 And in the Forwarding State Data is being forwarded, Root Ports and Designated Ports, those Ports are in the Forwarding State, and there is one other set of terms that we need to understand before we get into the Configuration. And those are the different link types we gonna have, we gonna see these link types as well as Port Roles, showing up in the output of show commands in our next topic. Let’s make sure that, we understand, what these terms mean. First, we have a Point-to-Point link type. You gonna probably guess that, a PPP link is interconnecting just 2 devices, it’s a link that’s in Full Duplex mode, and it typically interconnects couple of switches in this topology, we got 3 PPP links. Another link-type is a Shared Link type. 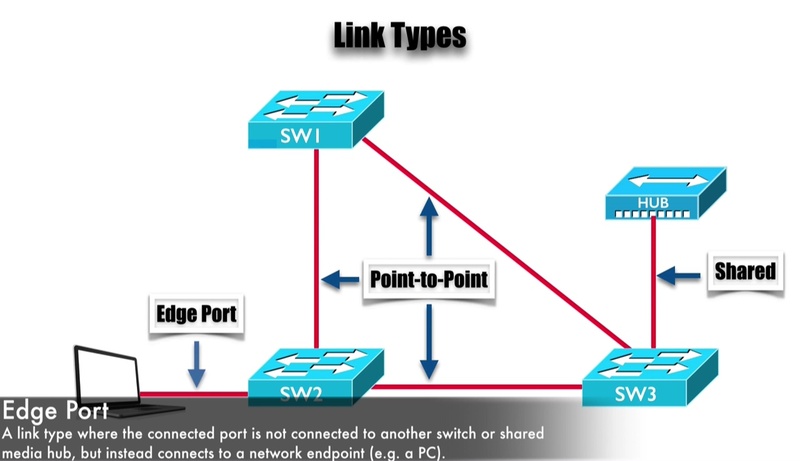 And we probably, specially in the Wiring Clauses Switches going to have lots of port’s that connects out to end user stations like laptop’s or PC’s or Printer and Servers, here we can see in Switch Sw2 is connected to a Laptop, what kind of link type connects out to end station, well it’s called an Edge Port. A Port that gets out to the that end station, we referred to that an edge port, and that Edge Port should never connected to another switch, when Rapid Spanning Tree Protocol is doing his calculations, it never considered an Edge Port as a candidate, to get this switch to back to the Root, and when we interconnect our switches, and our end Points and our Hubs may be we have a Half Duplex connection going out to a Hub, the Switch is going to default to a specific link type but we can override that link type Administratively if we want to, but here is an interesting thing. If we go in and tell a Switch that a certain Port is an Edge Port but then later, we forget that we did that possibly, and we connect a Switch in to that Edge Port, well when that Port sees a BDPU arriving from that other Switch, it’s going to realize that it’s not an Edge Port, and it’s going to Transition out of that Edge Ports States, and now we talked about some of these terms, let’s think about how Rapid Spanning Tree Protocol Convergence in the event of a Topology Change. First of all, let’s defined a Topology Change in Rapid Spanning Tree Protocol, when I say Rapid Spanning Tree Protocol, I am also talking about Rapid-PVST+, but Rapid Spanning Tree Protocol only considered a Topology Change to be a Port, that’s not an Edge. Why would be not considered that to a topology change. 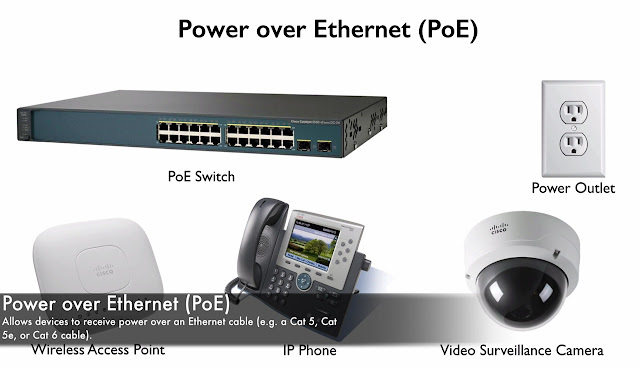 Well let’s imagine that, a port on a Switch goes down, and there is a Switch connected of that Port, there is a Down Stream Switch another words, the act that Port going down itself does not triggered a topology change, let’s say that, the Down Stream Switch has no other way to get back to the Root, that was it’s only connection and that connection just went down, if that Down Stream switch doesn’t have a another way to get back to the Root, there is only nothing we can do about that, no need to disrupt all our switches to say that, this link went down. 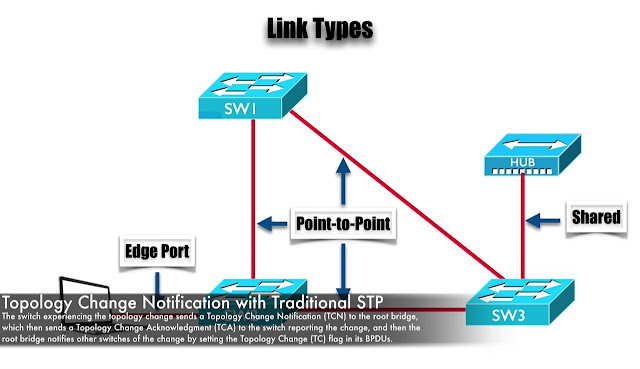 However, if that down Switch does have an alternate path to the Root, it should transition its Alternate Port to a Forwarding State, the Active Transitioning is, it’s Alternate Port to a forwarding Port, that’s gonna cause in this example that Down Stream Switch to notify the other Switches in the topology that change is occurred. When a Topology Change occurred, the Switch experiencing that change would send a “Topology Change Notification” to the Root Bridge, and the Root Bridge would then send a “Topology Change Acknowledgement” back to the switch that reporting to Topology Change, and then the Root would set to “Topology Change Bit” inside of this BPDU’s, that it sends out to other switches, telling those other Switches that there had been a Topology Change causing them to update their Mac-Address Tables.